We tend to be creatures of habit, ordering the same old foods whenever we go out to our favorite restaurants. Highlander almost always orders massaman chicken curry at Thai eateries. He loves different kinds of chicken curry that we have several recipe versions posted on our blog for National Curried Chicken Day. Massaman curry, in particular, is derived from an archaic word “mussulman” for Muslim, which influenced Thailand’s cooking style for this curry during the early centuries of trading between the Middle East and South Asia. Curry paste is first mixed with coconut milk or cream, making this dish slightly sweeter than other curries. A 2011 CNNGo reader’s survey even ranked massaman curry #10 in its list of the “World’s 50 Most Delicious Foods”. 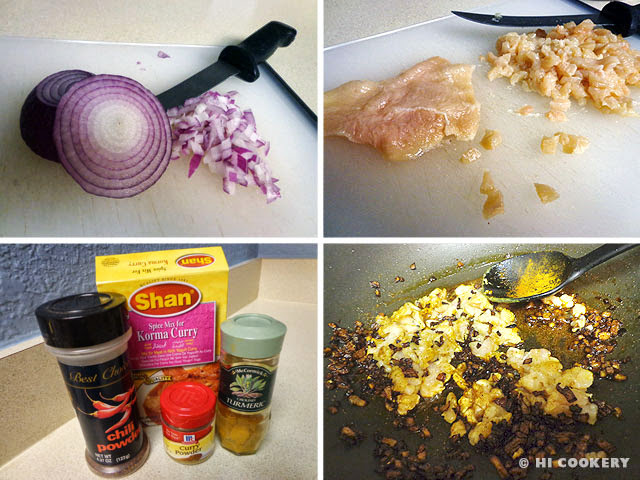 Following the Thai way, cook massaman chicken curry for National Curried Chicken Day! Cut the chicken into bite-sized pieces. In a large pot, stir one can of coconut milk with the curry paste. Simmer over medium heat for about five minutes. Add the chicken and the other can of coconut milk. Bring to a boil. Add the potatoes. Stir in the onions and baby carrots. Cover and heat until the chicken is cooked through (around 30 minutes). Garnish with cilantro. Serve hot with steamed white rice. Substitute the chicken for lamb, beef or other favorite meat/protein. Muslims do not cook pork in massaman curry. 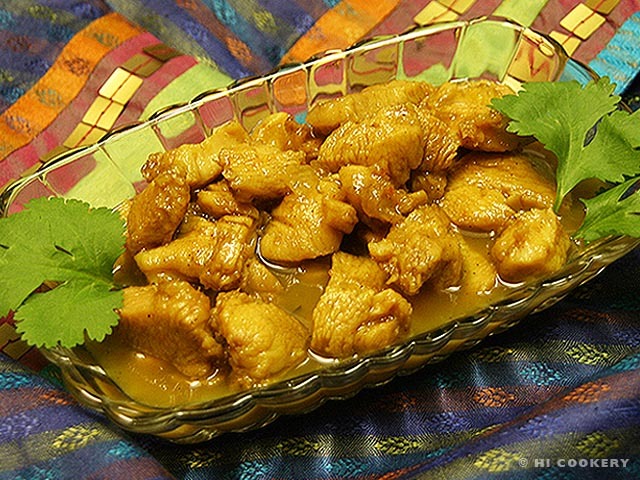 Search our blog for other curried chicken recipes for National Curried Chicken Day. 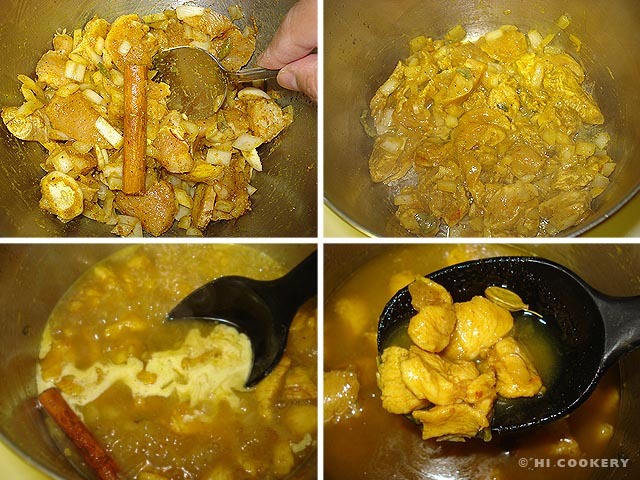 We have cooked different chicken curries for our blog before. But Islander seems to have gone back to the basics with her family’s Filipino-style chicken curry recipe for National Curried Chicken Day. This tasty dish is sometimes served at Filipino buffets and fiestas. The Philippines were ruled by the Indianized kingdom of the Hindu Majapahit, Khmer Empire and Buddhist Srivijaya for 2,000 years before the islands were colonized by Spain. There is still a big population of Indians in some areas. Thus, the Indian culture has influenced Filipino cuisine. This recipe fuses Indian curry spices with sour patis (Filipino fish sauce) to give this dish its distinct flavor. For a Filipino fusion food, try this Pinoy-style chicken curry recipe on National Curried Chicken Day. Prepare the vegetables by cutting the potatoes, onion and bell peppers. Set aside. Heat 2 tablespoons of the oil in a large pot. Cook the potatoes on medium high heat for about 5-7 minutes, stirring occasionally so they don’t stick to the pot. Transfer to a bowl and set aside. In the same pot, add 1 tablespoon of oil and lightly brown the chicken pieces. Add the onions and garlic to the chicken and sauté until the onions have softened. Season with patis (fish sauce). Sprinkle in the curry powder. Stir well with the water. Add the carrots and potatoes. Cover, lower the heat to medium and simmer for about 20 minutes, stirring occasionally. Stir in the coconut milk. Mix in the bell peppers. Season with salt and pepper to taste. Cook for another 10 minutes. Transfer to a large serving bowl. Serve hot with rice. Bottled patis (fish sauce) may be found in the Asian section of some grocery stores or in Asian markets. Search our blog for more chicken curry recipes. Find more Filipino recipes under the ethnic section of our Theme Menus. During our graduate school days, Islander’s “Singapore Sister” AAW introduced her to her country’s quintessential street food—curry puffs. These snacks satisfied her study-buddy when working together on projects late into the night at AAW’s apartment. Islander liked that her classmate had a small but private cooking area, unlike the inconvenience of the shared community kitchen in our dorm. 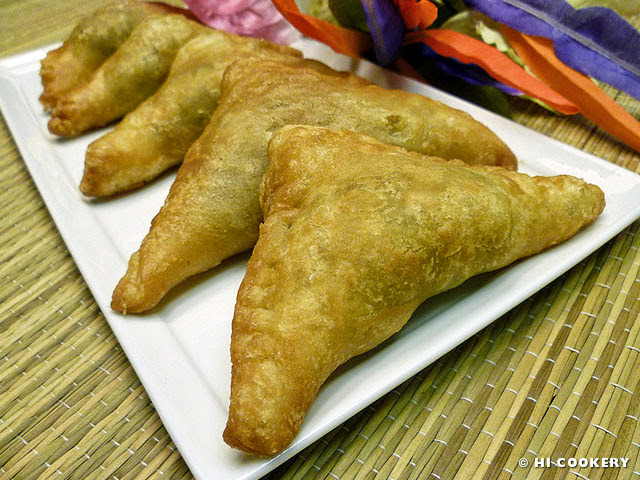 Curry puffs are delicious dumplings reminiscent of European pasties, Latin empanadas and Indian samosas. Malaysia, Thailand, Indonesia, the Philippines and China have various versions as well, with different fillings inside a doughy shell. AAW makes her curry puffs with potatoes, chicken, onions and spices and deep-fries the half circle-shaped parcels. We have adapted her recipe by using store-bought puff pastry, shaping them into triangles and baking them in the oven (although they can be fried, too). Fried or baked, try cooking a Singaporean snack, chicken curry puffs, on National Curried Chicken Day. Wash the potato and place in a pot of water. Cover and boil for 20-25 minutes; the potato does not have to be cooked all the way through as it will be sautéed and then baked/fried later in the process. 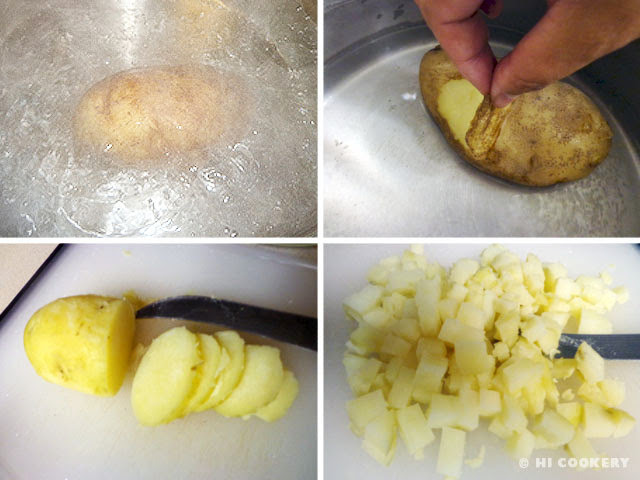 Remove the potato from the pot, cool, peel and dice into small squares. Set aside. Finely chop the onion and chicken. Set aside. In a skillet or wok, heat the oil. Sauté the onions until they are translucent. Add the curry, chili and turmeric powders and stir well, being careful not to burn the onions. Mix in the chicken, sugar and salt and pepper and sauté for about five minutes. Stir in the potatoes and blend well. Transfer to a plate and let cool. Remove the thawed puff pastry from the package and unfold them on a lightly floured surface. Cut each sheet into nine squares for a total of 18 pieces. Place a tablespoonful of filling in the middle of one square. Moisten two adjacent edges of the puff pastry with water. Fold into a triangle and press down on the edges. Use the tines of a fork to mark and seal. Place on a baking sheet lined with parchment paper. 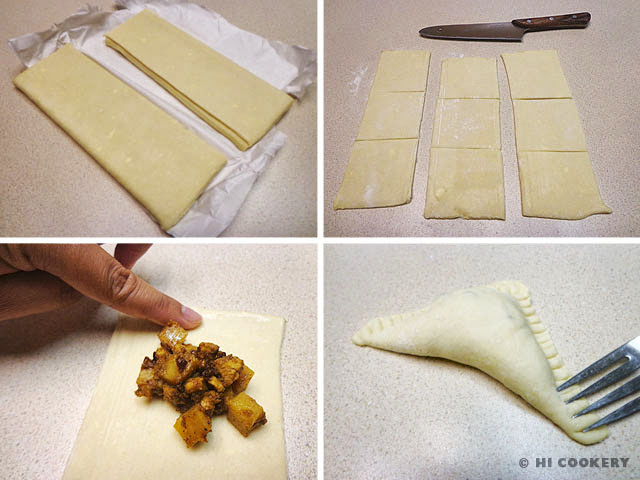 Continue making the rest of the curry puffs. The curry puffs may be frozen and cooked at a later time. To bake them, line a baking sheet with parchment paper or foil. Preheat the oven to 350 degrees F, then bake the curry puffs for 25 minutes or until golden brown. Remove from the oven and serve hot. To deep-fry them, heat the oil until hot. Carefully place the frozen parcels into the oil and fry for about five minutes or until golden brown. Drain on paper towels. Transfer to a platter and serve hot. We are still in touch with our “Singapore Sister”. Like us, AAW is in an intermarriage; her husband, Lars, is from Germany. We look forward to seeing them at Islander’s conferences and hope that she and AAW will continue working on special research projects about intermarriage. Korma curry powder may be found in Indian or Asian grocers or in the international foods section of the local supermarket. If this is unavailable, omit it and double up on the regular curry powder. Optional: If baking the curry puffs, brush the tops of the pastry with an egg wash (1 beaten egg with 1 teaspoon water) before baking. This will give a nice, golden brown sheen to the dumplings. 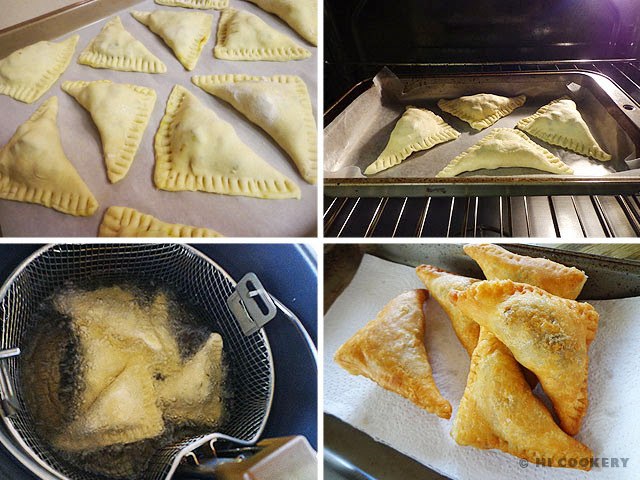 We made our curry puffs into triangles to avoid wasting scraps of dough. But they can be made into the traditional half-circle shapes by using a 3-inch round cookie cutter on the puff pastry dough. 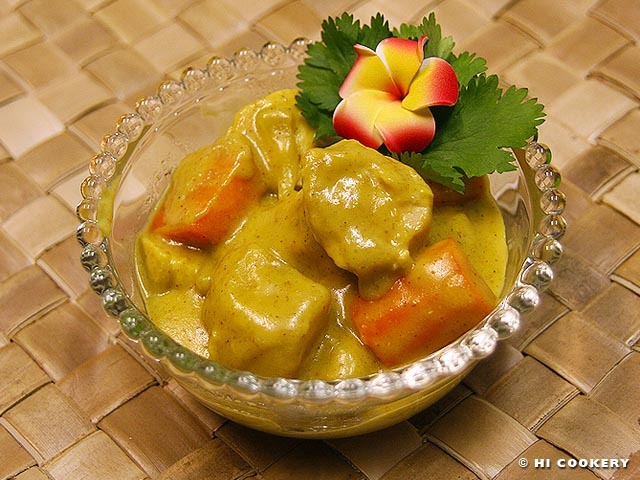 Check out our other international curried chicken recipes from Sri Lanka and Hawaii by searching our blog. Highlander has a hearty chicken salad or sandwich sometimes for lunch at work to tide him over till dinnertime. 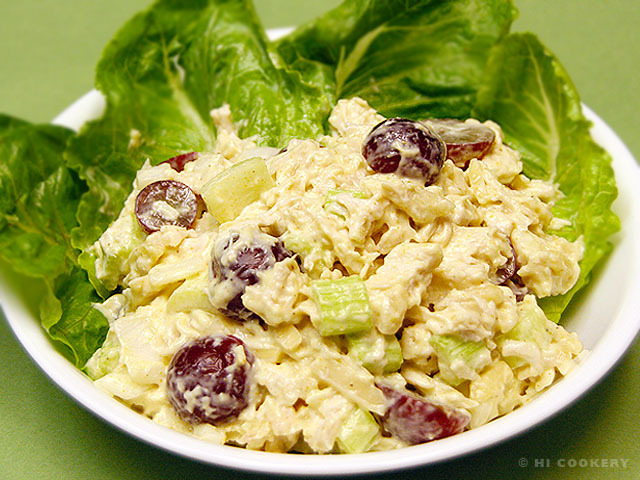 But some salads and sandwiches are bland so he likes his chunky chicken kicked up with curry flavor and slightly sweetened with slices of grapes. Celery and almonds also add a refreshing taste and crunchy texture. 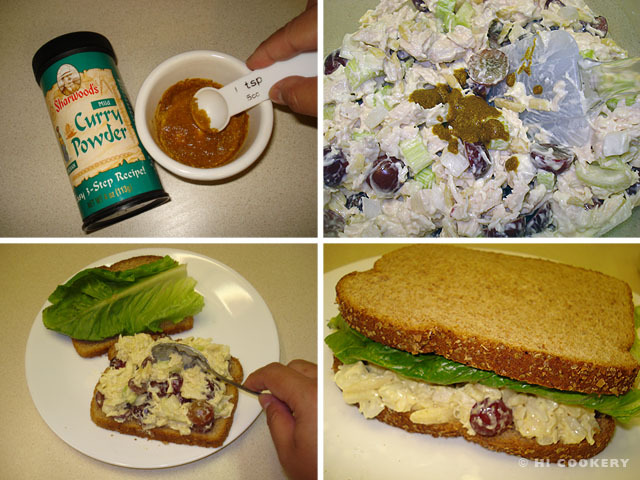 Our adaptation of a curried chicken recipe as a salad and sandwich is just as satifsying as a stew, which we have also prepared in the past, for National Curried Chicken Day. 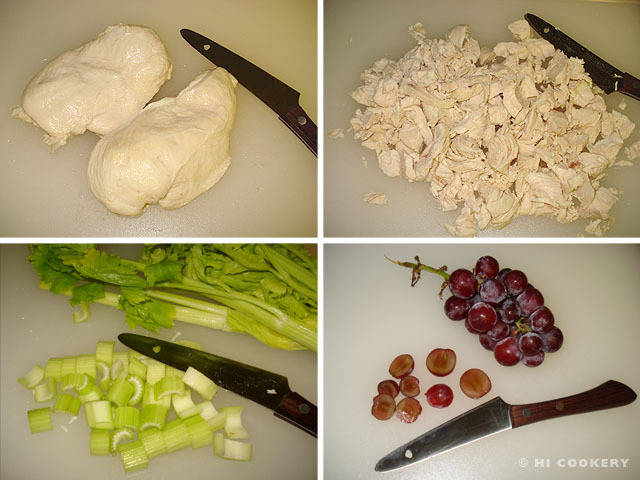 Coarsely chop the cooked chicken. Dice the celery. Cut the grapes in half. Chop the onions. 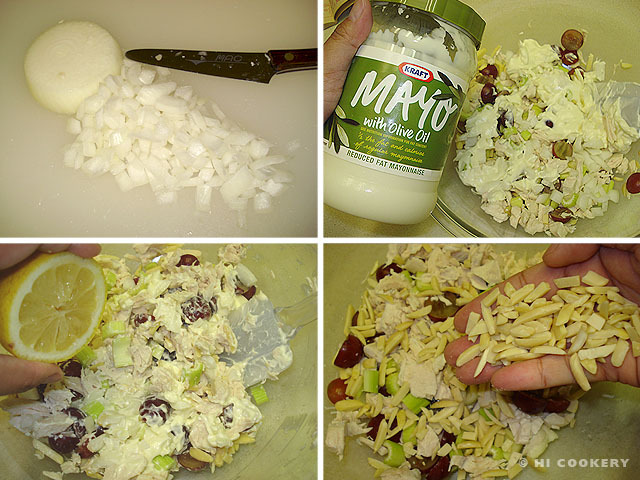 In a mixing bowl, combine the chicken, celery, grapes and onions with the mayonnaise. Stir in the lemon juice. Mix in the almonds. Season with salt and pepper. 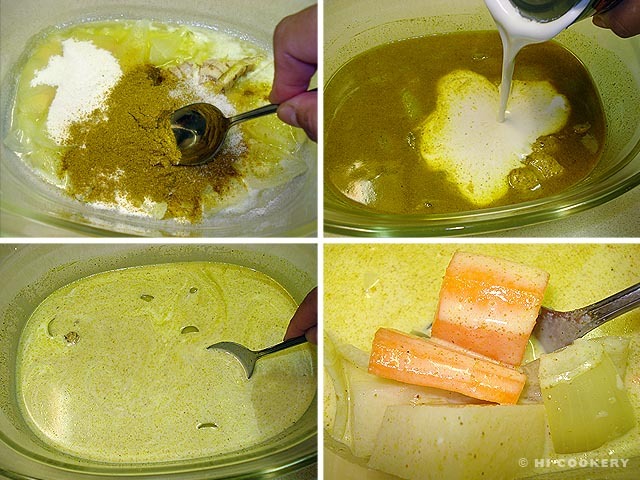 In a small cup, make a paste with the curry powder and a little water. Mix it in with the chicken salad until well blended. Refrigerate for at least an hour to allow the flavors to mingle. Arrange with fresh lettuce leaves in a chilled bowl and serve as a salad. Or spread between two slices of bread and a lettuce leaf and serve as a sandwich. For another curried chicken sandwich recipe, try the tea time version called Coronation Chicken. 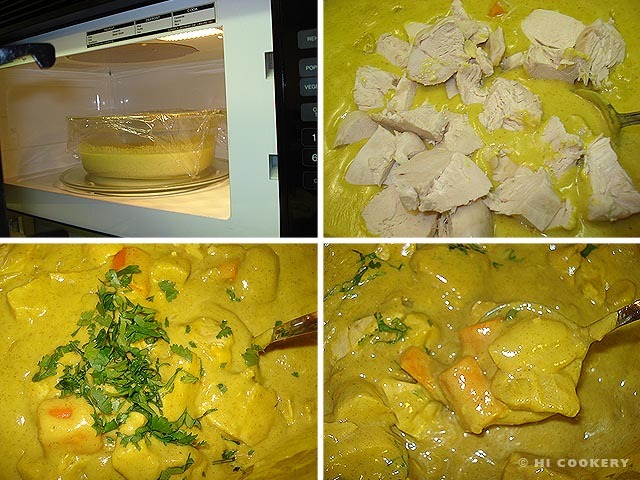 For curried chicken stew recipes, cook Kukul Mas (Sri Lankan version) or microwave our Hawaiian version. Search our blog for other recipes containing curry as an ingredient. Chicken curry is a college comfort food for Islander. She and her Sri Lankan roommate, Champa S., would eat her kukul mas (see our blog recipe post) during their university days together. When Islander moved to the mainland for an advanced education, she continued to cook chicken curry using a packaged mix in the microwave at the dorm lounge when the cafeterias were closed. She shared her version of the Hawaiian-style stew with other international residents, including hungry Highlander, during study breaks and socials. Cooking chicken curry from a mix made for an easy microwavable meal when we got married. But the seasoning packets are not always available so Islander has been preparing Hawaiian chicken curry from scratch. For National Curried Chicken Day, our blog recipe post features a local-style stew (not the touristy-type dish containing pineapples!) that is a popular menu item at Hawaii diners, drive-ins and restaurants. Boil the chicken for 15-25 minutes. Let cool and chop into bite-sized pieces. Melt the butter with the onion, garlic and ginger in a covered microwave-safe casserole dish for about 3 minutes. Stir in the curry powder, flour and salt. Mix in the coconut milk and broth. Add the carrots and potatoes. Cover and microwave for 10 minutes, stirring occasionally, until the sauce is thickened. Check to see if the vegetables are softened and cooked through; if not, microwave for another 5-10 minutes. Add the chicken to the curry sauce. Cover the casserole dish and microwave for another 3-4 minutes. Stir to coat the chicken with the curry sauce. Serve hot with a garnish of chopped cilantro. Serve Hawaiian chicken curry over scoops of steamed white rice with a side of macaroni salad for a perfect plate lunch—local-style! Search our blog for posts on other curried chicken recipes. One of Islander’s first college roommates, Champa S., is from Sri Lanka. From freshman to senior year, they did a lot together—from taking the same core courses and getting involved in campus ministry to studying for final exams and cooking simple meals in the dorm kitchenette. Islander’s fond food memory of Champa is when she would cook an aromatic and tasty kukul mas (Sri Lankan-style chicken curry) on Sunday evenings that would sustain us for a few days when the school week got busy with classes, part-time jobs and extra-curricular activities (there were no distractions from guys back then as we both were thinking about becoming nuns at one point in our lives—obviously, Highlander was happy that Islander changed her mind!). Although both roomies have moved several times since graduation, they have kept in touch and even visited each other. Whenever Islander reunites with Champa in her current Maryland residence, she cooks her chicken curry for old times’ sake! For National Curried Chicken Day, we present a kukul mas recipe inspired by Islander’s former college roommate from Sri Lanka. 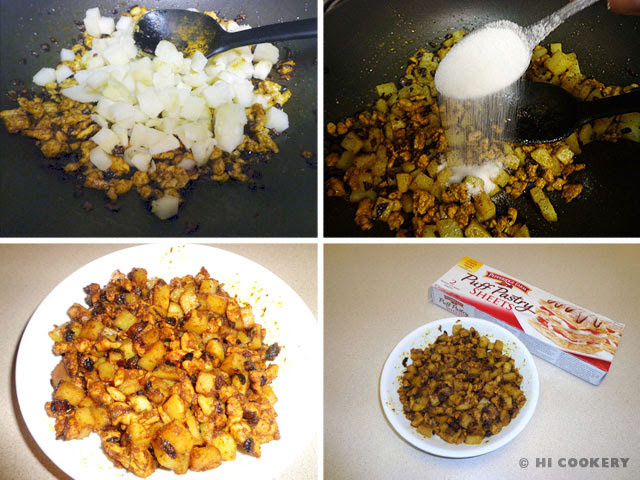 Make the Sri Lankan-style roasted curry powder by frying the coriander seeds until golden brown. Stir in the cumin, turmeric, fennel, cinnamon, cloves, cardamom, curry and peppercorns. 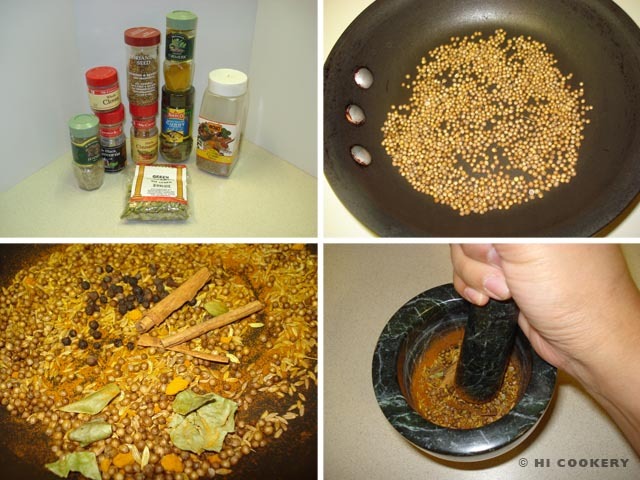 Mix until they turn to a brownish color, being careful not to burn the spices. Using a mortar and pestle or blender, grind into a powder. Store in a spice bottle or jar until ready to use. This homemade blend may keep for months if tightly covered and stored in a dry place. Chop the onion, mince the garlic clove and crush the ginger piece. 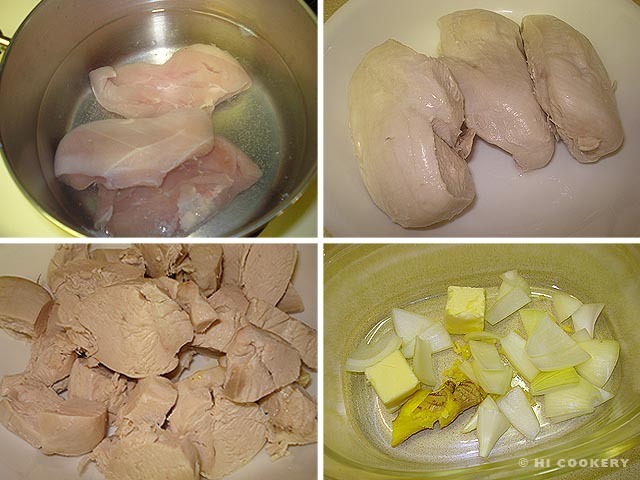 Cut the chicken breasts into bite-sized pieces and place in a bowl. Add the onion, garlic, ginger, cinnamon stick, salt and pepper, saffron, chili powder and vinegar. Sprinkle in the Sri Lankan roasted curry powder and mix well. 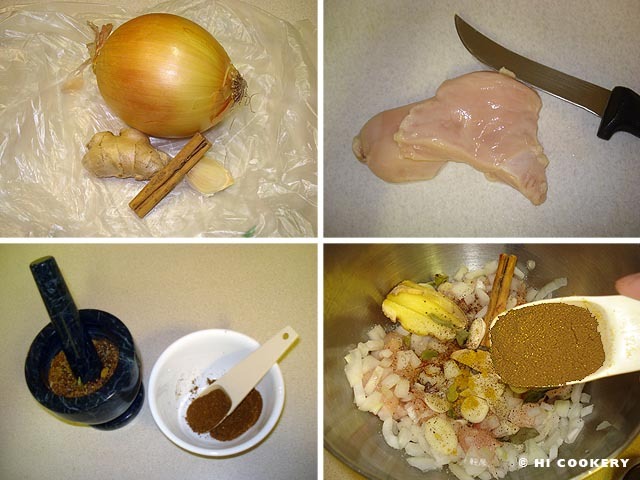 Cover and refrigerate for at least an hour or overnight to marinate the chicken. In a sauce pan, heat the oil. Fry the chicken pieces until light browned. Stir in the cloves and cardamom pods. Reduce the heat to low, cover the sauce pan and cook until the chicken is tender (about 10 minutes). Pour in the coconut milk and stir. Simmer at medium heat for about 15-20 minutes. Ladle into a bowl. Garnish with cilanto (optional). Serve hot with rice. We have enjoyed eating many versions of chicken curry with our international friends. Our blog will feature their recipes in future posts.